The Type 1 Economy Turbidity Curtain is a low-cost barrier designed for calm water containment applications where there is minimal demands on the barrier. Built from reliable, yet economical fabrics, these curtains are a favorite for short-term projects and other applications requiring a temporary or low budget solution. Type 1 Economy Curtains are the perfect option for small sites in need of short-term or non-DOT regulated turbidity curtains. Made with a 13 ounce fabric, these barriers are an economical way to keep materials contained. Sections featured here are available in 100 ft. lengths and 5 ft. depths. Material used for the barriers feature a 13 oz. impermeable PVC with grommet section connectors. When looking through our turbidity curtain variety, many customers ask what the main difference is between the two type 1 turbidity curtain models (Type 1 Economy and Type 1 DOT). To answer this question, the main difference between these two models is that one is designed for applications where DOT standards are not required and the other is designed to meet DOT specifications. Thus, the economy model would be used in locations where turbidity control was required, but where meeting DOT regulations was not a requirement. By contrast, the DOT model might be used in areas such as roadsides, rivers, and constructions sites where DOT (Department of Transportation) requirements needed to be met. What Length is Required? Typically you will want the barrier to sit along your work area to provide containment of silt and sediment in your area. Sections of these curtains are made in lengths of either 50 or 100 feet. Multiple sections can be connected together to form the needed lengths in your location. What is the Depth of your Water Area? 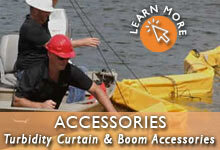 In addition, curtain depths are also chosen based on the depth in your water location. We typically recommend that the depth of your curtain allow the barrier to sit approximately one foot from the floor of your water location. If you are dealing with a location that has moving waters, you may also consider using one of our stronger Silt Curtains, such as the Type 2 or Type 3 curtain.